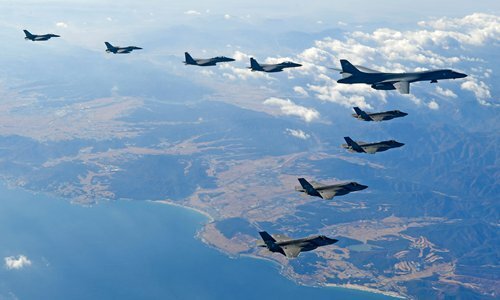 A US B-1B bomber on Wednesday joined large-scale US-South Korean military exercises that North Korea has denounced as pushing the peninsula to the brink of nuclear war, as tensions mount between the North and the US. The bomber flew from the Pacific US-administered territory of Guam and joined US F-22 and F-35 stealth fighters in the annual exercises, which run until Friday. The drills come a week after North Korea said it had tested its most advanced intercontinental ballistic missile capable of reaching the US. Asked about the bomber's flight, China's foreign ministry spokesman Geng Shuang told a regular news briefing in Beijing: "We hope relevant parties can maintain restraint and not do anything to add to tensions on the Korean Peninsula." North Korea's official KCNA news agency said on Tuesday that the exercises in which the bomber took part are "simulating an all-out war," including drills to "strike the state leadership and nuclear and ballistic rocket bases, air fields, naval bases and other major objects." US Republican Senator Lindsey Graham on Sunday urged the Pentagon to start moving US military dependants, such as spouses and children, out of South Korea, saying conflict with North Korea was getting close. South Korean President Moon Jae-in will visit China next Wednesday, Seoul's presidential Blue House said. North Korea's increasing nuclear and missile capability would top the agenda, it said. Meanwhile, a newspaper report from Northwest China's Jilin Province that borders North Korea published an article on Wednesday on how to protect oneself from nuclear attacks, sparking heated discussions online as fears rose of possible clashes on the Korean Peninsula. Jilin Daily, a newspaper affiliated with the Communist Party of China (CPC) Jilin Committee, published a report on Wednesday describing nuclear weapons, protective measures against nuclear radiation and the difference between an air raid in wartime and normal disasters. The Air Defense office of Jilin told the Global Times on Wednesday that it wrote the article and it was part of the national defense education. "We provide monthly articles on national defense education and protective measures against disasters to the newspaper. This month features an article on nuclear weapons," an anonymous employee from the office said, adding that the article has nothing to do with the political situation. The article provides some information on nuclear weapons, including classifications, characteristics, nuclear explosions and the damage they could cause. The article explains how to protect oneself from nuclear weapon explosions, saying that people should take quick action once they see the flash of an explosion, including shockwaves and optical radiation. The report also showed pictures on how to reduce radioactive contamination, including cleaning clothes and shoes and taking a shower to clean the mouth and nose. The report sparked heated discussions on Chinese social media with some referred to the strained situation on the Korean Peninsula and North Korea's nuclear tests. "Heated discussions are understandable considering that Jilin borders North Korea, which has established nuclear facilities near the border. Fears of clashes on the Korean Peninsula have also increased after the US and South Korea conducted joint drills on the heels of North Korea's latest missile test," Lü Chao, a researcher on North Korea at the Liaoning Academy of Social Sciences, told the Global Times on Wednesday.